Make the pastry by mixing the flour, icing sugar and xanthangum together in a large bowl. Rub in the cold butter with your fingertips until the mixture resembles fine breadcrumbs. It’s important that the butter is cool and not at room temperature, as the pastry will be tough if the butter is soft. Make a well in the centre of the bowl and add the beaten egg. Combine all the ingredients by hand, but try to work quickly to prevent the pastry from becoming too greasy. This mixture can be quite wet when it’s mixed, but once it’s rested it’s easy to use. Once combined, form into a ball, wrap the dough in cling film and leave to rest for at least 1 hour in the fridge. Roll it out and use it to line a 27cm flan tin, then prod the base all over with a fork and return to the fridge for at least 15 minutes. Better still, it’s worth resting the dough for 20 to 30 minutes in the fridge after you line the flan tin and before filling it to reduce the possibility of shrinkage. 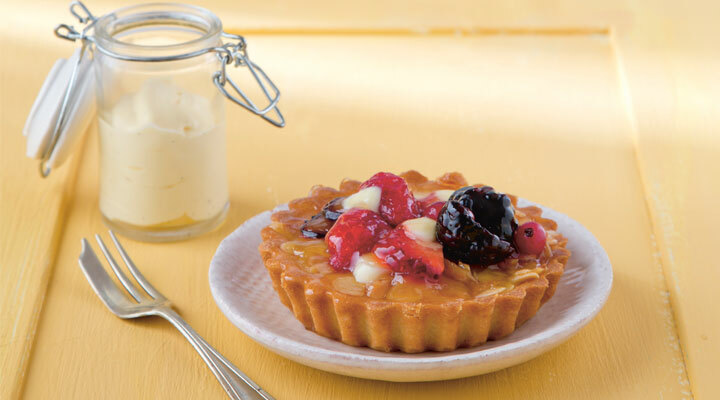 To make the frangipane, cream the butter and icing sugar together with an electric mixer. Mix the ground almonds with the flour in a separate bowl. Add the egg yolks to the butter mixture along with half of the flour mixture and combine well. Add the egg whites and the remaining flour mixture and mix well again, stopping to scrape down the sides of the bowl occasionally. Pour the filling into the chilled pastry case and bake for 25 minutes, until the tart is light golden and firm to the touch. Remove from the oven and cover with the frozen mixed berries and white chocolate drops. Turn off the oven but place the tart back in the oven for 2 minutes to allow the fruit to thaw out. This way, you’re only melting it slightly and defrosting the berries. To glaze, combine the apricot jam with the boiling water and heat in the microwave or in a small saucepan on the hob until it melts. Brush gently onto the tart. Serve with some fresh cream or crème anglaise and vanilla ice cream.